This situation will be familiar to most: the weekend is fast approaching and a big shop is needed before the relaxation can really start. A quick trip to the supermarket, discount store or drugstore is in order. It is rather practical that the various shops are often close together on the edge of town, meaning all products can be found with just a very short walk between stores. While this saves consumers time, it is hard work for retailers. Discount stores, full range supermarkets and drugstores are all competing for customers in a small area. Only those who have the strongest brands as well as a positive retailer image will succeed in this environment. 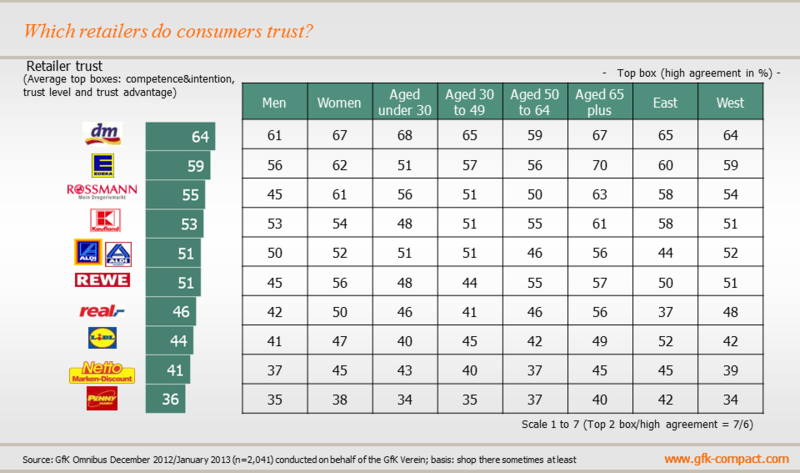 Back in 2010, the GfK Verein carried out a survey about trust in retailers on around 2,000 consumers, who were representative of the German population (here you can read the former focus topic). Germans have now once again been asked to evaluate three different retail outlets presented to them at random. The only prerequisite then and now was that the consumers had to have shopped there at some point so they were in a position to pass judgment. The overall result was that the trust potential of retail outlets for fast moving consumer goods with the strongest sales was established. Is the retailer trying as hard as possible to satisfy my needs? Do I have full confidence in the retailer? Can I trust that retailer more than another one? GfK ascertained trust in retailers on the basis of these questions relating to competence, intention, level of trust and trust advantage. The drugstore market, in particular, has experienced a great deal of change over the last year. Following the bankruptcy of Schlecker, which dominated the news for many months, the market for perfume, shower gel and other toiletries has been changing. Schlecker was already tenth (i.e. last) in the trust rankings back in 2010 and has now disappeared completely. In addition to errors in management of the company, bad press and poor liquidity, the falling trust of consumers is certainly likely to have added momentum to the downward spiral into bankruptcy. If consumers only have very little confidence in a company, they will shop there less often or not at all, and sales will fall as a result. Breakdown in trust of one retailer automatically benefits competitors. Other drugstores were able to take advantage of Schlecker’s collapse in order to gain potential new customers. In comparison with 2010, dm once again improved and continues to be in the top spot for all three elements of retailer trust. But the competitors are not sleeping. For example, Rossmann not only registered record sales and growth figures in 2012, but also saw a considerable improvement in its standing among Germans in comparison with two years ago. More than half the respondents are confident that the drugstore giant has good intentions and the necessary expertise. Overall, 60% fully trust Rossmann, while almost half think that they are better off shopping there than elsewhere. These results meant that the company climbed from number six in 2010 to number three in the latest survey. Between number one in the rankings dm and competitor Rossmann is Edeka. Germans continue to have above-average trust in this full range supermarket, so their second place in the ranking is secure. Overall, there has been very little change among the full range supermarkets: Kaufland, Rewe and Real continue to be middle of the pack when it comes to popularity among consumers. 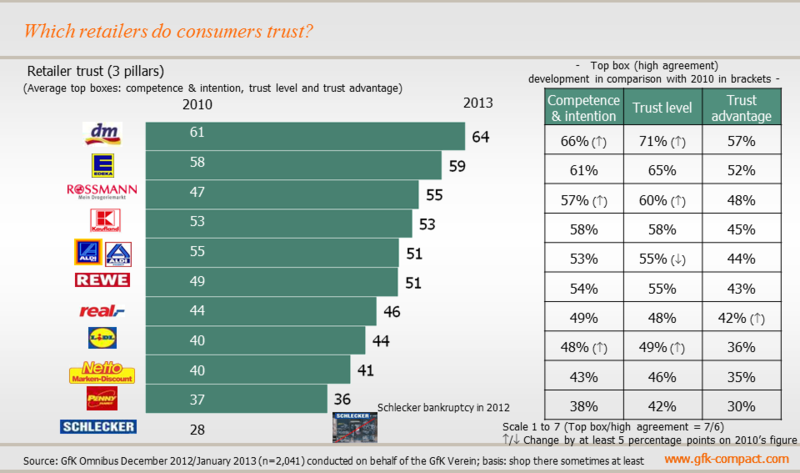 For the question on trust advantage, only Real improved in comparison with competitors. The situation is rather different for discount stores: Aldi, the market leader for many years, was most recently in third place, but seriously needs to give customer loyalty some thought. Although the ‘original’ discount store is still ahead of its competitors, Lidl, Netto and Penny, the level of trust has fallen by four percentage points in comparison with two years ago. This could be attributable to the negative headlines relating to employee management at Aldi, which attracted consumers’ attention last year. Lidl, however, developed more positively. Although it has also suffered its share of bad press in the past, consumers have a higher opinion of this discount store than they did two years ago. Lidl improved in terms of general trust as well as intention and competence. Netto and Penny bring up the rear, with the latter taking Schlecker’s place at the bottom of the trust rankings. Considerable differences become apparent if taking into account sociodemographic factors such as gender, age and origin of consumers. When East German consumers rate the trust they have in their retailer, Kaufland, Lidl and Penny performed better than in West Germany, where Real is afforded a greater level of trust. Individual retailers also vary their operations at regional level. For example, when Penny began to strongly develop its regional range a few years ago, the company chose to first launch the strategy in East Germany with the motto “Östlich = Köstlich!” (East = delicious). Regardless of origin, men are more skeptical about most companies than woman, who generally stated a higher level of trust. Only for Kaufland, Aldi and Penny were the trust levels of male respondents similar to those of women. Across almost all generations, there is agreement on the question of which companies are most trusted. The drugstore dm was first in all age groups but one; Edeka was number one for consumers over the age of 65. With a high trust value of 70%, this full range supermarket successfully ousted dm from the top position. If you have any queries please contact Claudia Gaspar (claudia.gaspar@gfk-verein.org) or Claudia Stürmer (claudia.stuermer@gfk-verein.org) of the GfK Verein.